This week, I am proud to introduce Mercedes Soria as a Goddess who is on the Go, leading developments on making this world SAFER with Knightscope, Inc, a Silicon Valley startup using AI and Robotics. She is also focused on making this world FAIRER by championing women empowerment and STEM opportunities through the United Nations TECHWOMEN. Have I mentioned, Mercedes is a super cool, super smart, and a colorful person? 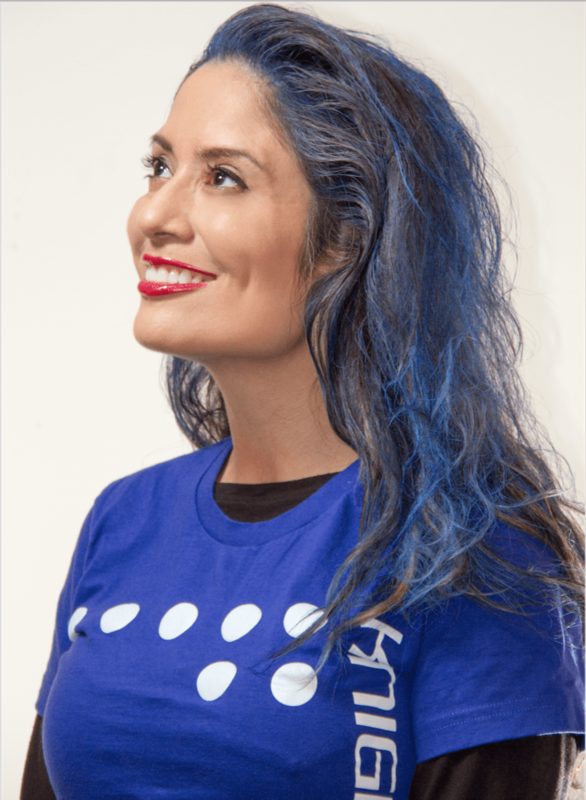 My name is Mercedes Soria, I am a Software Engineer. My title is VP of software Engineering at Knightscope, an Artificial intelligence and Robotics startup in Silicon Valley. We build autonomous security robots that aim to predict and prevent crime. Mountain View, the heart of Silicon Valley! Did what you study have anything to do with your current career? Yes! I developed a liking for Science fiction books when I was younger and the closest field to make what I read about a reality was technology. Artificial intelligence specifically. I have a BS and MS in computer science so my current job is the perfect job for me! What are your biggest career assets? Did you have a mentor or someone to help you navigate through your career? If so, please describe. If not, do you think you could have benefited from one? The closest thing to a mentor that I had was my mother. She raised 2 girls as a single mother and she always stressed just how important an education is. She is 70 years old and getting her second PhD! I have had career mentors in different aspects of my life, but I would have loved to have a woman show me the way, especially in my technology career where most of the time I am the only woman in a room full of men. I really try to find opportunities to mentor younger women and give them some sort of a role model that they can look up to and who could communicate to them just how far they can get and that anything they wish to achieve is within their power to make it so. I got there but it took many bumps in the road. So if I can in any way help others smooth their path to success, I really try to spend the time. Gender diversity is a big one, especially in Silicon Valley. Women are still in the minority in STEM careers. Also women in C-level positions are very much under represented, out of the Fortune 500 CEOs, only 30 are women. 470 are male. Can you believe that? We have such a long way to go. Regardless of political party I really admire Hillary Clinton, she experienced the glass ceiling all throughout her career and she set her sights on the most influential job in the world. The presidency of the United States. My goal is to help as many women as I can possible come in contact with to shatter that glass ceiling. I am huge on women empowerment. By taking charge of my career. When I looked for a mentor and got one, he asked me what I wanted to do for work and what were my goals in life and once I told him my plans and how I planned to get there he pretty much told me, “there is nothing more I can do for you, you are already doing all the right things. After that, I decided that I needed to be the architect of my own life and that I needed to work extra hard to achieve my goals. There have been ups and downs in my life but I would like to think that I am exactly where I am supposed to be. How do you keep your life in balance? I am not sure I have a balance in my life, I am always go, go, go. I give 110% at work and at home. I am also a ballroom dancer as a hobby (2 US Championships under my belt!) which helps me use the creative side of my brain. I believe that we have just a short time on this earth and it would be a shame to waste any time by sitting still! Women Empowerment means that we can walk into a room and be confident knowing that we have a lot to offer to this world not only career wise but also as people. It means that we can wear makeup, skirts and all things girly and celebrate each other and support each other. It means being proud of who we are! Someone told me “be so good they cannot ignore you.” It stuck with me. Never doubt yourself, always trust your gut and never let anyone stop you from becoming the best version of yourself that you can be. The world is your playground! I am working with the TechWomen program from the State department where we bring women from Asia, Middle East and Africa to the US to be mentored by outstanding women here. My number one goal is to bring my message of women empowerment not only to the US but also to South America (where I am from) and to the rest of the world. I got to do some of that a couple of weeks ago when I was selected to share my opinions about gender equality as part of the United Nations USA 2018 Global Summit. Career wise, I have my eyes set in a CIO position!